All Star Trek fans know what stardates are. Theyre those silly numbers with a decimal point that the captains of all the Trek series (with the exception of Star Trek: Enterprise) have used to record the passage of time in a non-Gregorian way. In Trek mythology, it appears that the stardate system is adopted across the Federation some time between 2161 (the end of Star Trek: Enterprise) and 2265 (the year in which the Original Series episode Where No Man Has Gone Before is now assumed to take place). 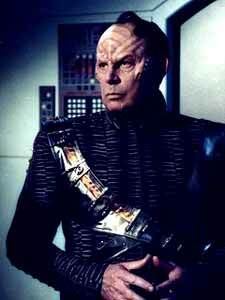 Stardates are seen to be in use as far back as the 2150s, by species including the Vulcans and the Xindi, though Earth has not yet embraced the system at this time. In the episode Damage, the Xindi-Primate Degra sends a coded message containing co-ordinates and a stardate for where and when the Enterprise should rendezvous with his ship. TPol is able to determine that the stardate is three days hence. Behind the scenes, stardates were originally invented in order to remind viewers that the show is set in a distant future, without tying the series down to a specific year or even a specific century. 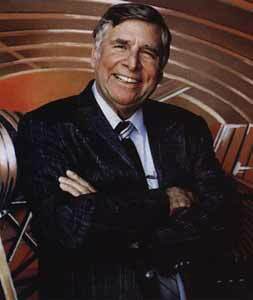 Creator Gene Roddenberry was all too aware that the pace of technological change can be hard to predict - who knew how many years it would take for interstellar travel or transporter technology to become a reality? The captains log voice-overs were also useful devices for recapping the story so far following a commercial break. 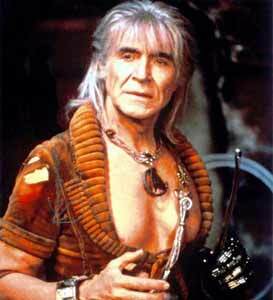 Later on, the movie Star Trek II: The Wrath of Khan specified the century (the 23rd), before the Next Generation episode The Neutral Zone mentioned the year for the first time (2364). 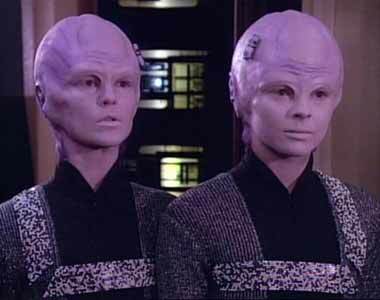 However, stardates remained in use throughout TNG, Deep Space Nine and Voyager, as part of the traditional Star Trek formula. Unfortunately, despite having the best of reasons for introducing the concept of stardates, Roddenberry failed to devise a proper system with which writers could apply them. Little thought was given to the numbers used in The Original Series, except that they generally increased over time. Any viewers who have paid much attention to The Original Series and The Animated Series will probably have noticed that stardates often dont progress in either production order or broadcast order. This is partly because, when the episodes were filmed, the production team had little or no idea in which sequence the television network would choose to transmit them. However, this is not really a problem: we can simply assume that the events take place in a different order to that in which they were produced or aired. What is more difficult to explain is how stardate time seems to progress at different rates over different periods. For instance, the duration of Captain Kirks initial five-year mission on board the USS Enterprise appears to take place between the stardates 1310.0 (around the time of Where No Man) and 7405.0 (after the events of the animated episode Bem). This implies that each year of that mission lasts for approximately 1200 stardate units. In light of this calculation, the gap of just 0015.0 stardate units between the end of Where No Man and the beginning of Mudds Women seems incredibly small when you consider all the upgrades that the starship and its crews uniforms evidently undergo between the two episodes (which, in the real world, were due to sets and costumes being redesigned between the production of the second pilot and the first season proper). However, thats nothing compared to the miniscule gap of less than 0008.0 stardate units that exists between the end of Bem (stardate 7403.6) and the beginning of Star Trek: The Motion Picture (stardate 7410.2), during which time Admiral Kirk spends two and a half years away from the captains chair serving as Chief of Starfleet Operations! There are also several instances in which the values of stardates contradict the explicit order of events, while on other occasions the dates of certain episodes overlap each other. Should we therefore simply disregard stardates? I dont think so. They are as much a part of Star Trek mythology as transporters, tricorders and warp drive. 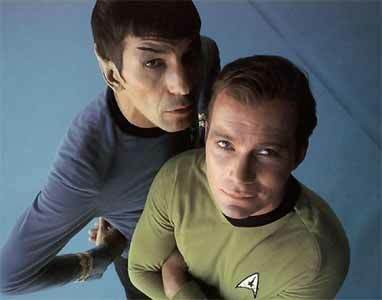 To ignore them would be like ignoring Captain Kirks middle initial, another staple ingredient of Trek that hasnt always been applied consistently. 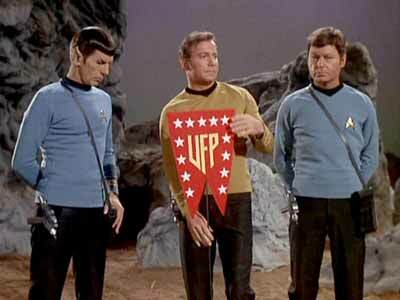 The first time we encounter Kirks middle initial, in the episode Where No Man Has Gone Before, it is inscribed on a gravestone that his super-powered former friend Gary Mitchell has created. It reads: James R Kirk. 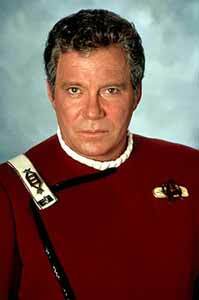 However, every subsequent reference to Kirks middle name has been T or Tiberius. Do were therefore ignore the fact that Kirk has a middle name? No, of course we dont. Do we take the first instance as canon and the rest as mistakes? No: we accept the vast majority of instances that are consistent (all the instances of T and Tiberius) and dismiss the minority (the single instance of R). We can go further, though, by attempting to rationalise the anomalous minority. In his trilogy of novels My Brothers Keeper, Michael Jan Friedman suggests that the initial R is a private joke shared by Kirk and Mitchell that stands for various things, including racquetball (Racquetball? Thats practically my middle name!) and even rhinoceros. Following this line of reasoning, it could also stand for Republic, the vessel on which these men first served together on a training mission. Or it might mean rulebook, given Mitchells recollection, in Where No Man of Kirk being a stack of books with legs in his academy days. Peter Davids novel Q-Squared implies that the events of Where No Man take place in a parallel universe. Alternatively, maybe Jim lied to Gary about his middle name, to prevent being teased about it. We can approach stardates in the same way: accept the instances that make sense, and disregard or attempt to explain those that do not. The relativistic explanation is nonsense, because if starship crews really were susceptible to such effects when travelling at high velocities, the time dilation they experienced would be in the region of years or centuries, not mere hours or days. Therefore we must accept that warp-drive technology ordinarily avoids the issue of time dilation, because its method of warping (bending) space effectively shortens the distance between two points. It is more likely that disparities in stardate progression can be attributed to variations in local space-time conditions. The Original Series episode The Naked Time suggests that the ships chronometers are able to display relative time, as determined by an external source, rather than subjective time - how else can the chronometer on Sulus panel determine that the ship is travelling backwards in time? The TNG episode Cause and Effect reveals that it is sometimes necessary for Starfleet vessels to contact a nearby time beacon in order to re-synchronise their internal chronometers following exposure to local temporal distortion. 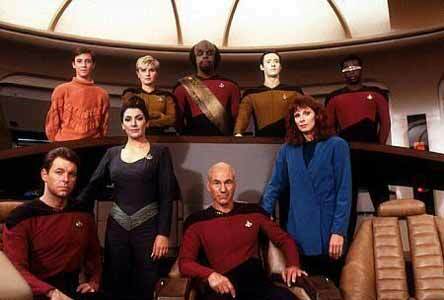 When The Next Generation went into production, efforts were made to devise a more cohesive system of stardates. This used five-digit numbers, initially starting with a 4 (representing the 24th century), followed by the season number. Thus, first-season stories have stardates that begin 41---, second-season stories are indicated by 42---, and so on. After a fairly shaky start, these dates progressed in an orderly fashion. Deep Space Nine and Voyager retained the same system, though the numbers eventually increased to the point at which the first digit was 5 (this digit does not represent the 25th century). 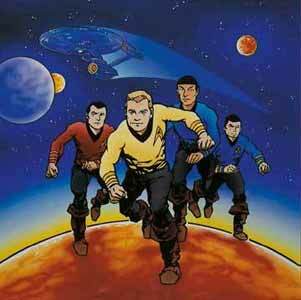 In this era, each television season occupies one Earth year in the Star Trek universe. Thus, 1000 stardate units are equivalent to one year. One stardate unit is equal to 0.36525 days, or 08 hours 45 minutes 57.6 seconds. In another words, one Earth hour equals slightly more than 0.114 stardate units (give or take the aforementioned variations in local space-time conditions). It is commonly supposed that 24th-century stardates are aligned so that a stardate divisible by 1000 occurs close to the start of a year on the Gregorian calendar. However, there is clear evidence to dispute this. When Captain Picard visits France in the episode Family (stardate 44012.3) the sunny weather suggests spring, summer or early autumn rather than winter. In Datas Day, the android logs a stardate of 44390.1 and states that the ship is preparing to celebrate the Hindu festival of lights. Otherwise known as Diwali, this celebration occurs each year during mid- to late October or early to mid-November. Taking this evidence into account, the start of each year on the Gregorian calendar would occur around the stardate --600.0 mark. Stardates divisible by 1000 would therefore occur some time around June. This suggests that a different stardate system is in use prior to 2322. Perhaps this year witnesses a crucial turning point in Federation history, which is marked by the new dating system, rather like the adoption of Anno Domini a couple of millennia ago. Once we accept the likelihood that stardates are reset to zero during the 24th century, we invite speculation that the sequence may have gone though a number of previous resets. 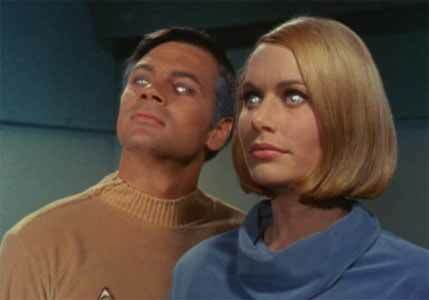 For example, in Where No Man (stardate 1312.4-1313.8), onscreen medical records for Gary Mitchell and Elizabeth Dehner show their dates of birth as stardate 1087.7 and stardate 1089.5 respectively. Mitchells age is recorded as 23, Dehners as 21. One interpretation of these figures is that stardates passed far more slowly during the years leading up to 2265, with just one stardate unit being roughly equivalent to one Earth year! Its understandable that this system might prove unpopular, because of the need for excessive numbers of decimal places in order to represent accurate dates, which might explain the adoption of faster dates by stardate 1110.7 (1087.7 + 23). 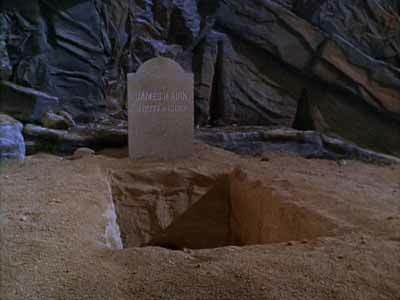 However, Kirks gravestone in the same episode shows a birth date of stardate 1277.1. How can this fit in with the above? It is extremely unlikely that Kirk is younger than Mitchell. 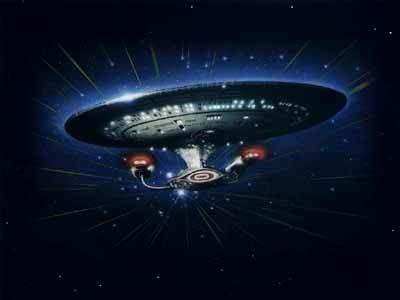 Some fans believe that 1277.1 may refer to the date on which Kirk assumed command of the Enterprise. Alternatively, it could be that four-digit stardates are routinely reset about once every decade. This would mean that the numbers cycle back around to zero once between the birth of Kirk and that of Mitchell, and twice between Dehners birth and the events of Where No Man. This would also mean that Mitchell and Dehner are born within hours of each other, but that is entirely possible, if coincidental. The ages shown on their medical records could indicate their ages at the time of their respective medical examinations rather than their current ages. This notion of resetting the clock could also account for the stardate of 2794.7 attributed to Governor Kodoss slaughter of more than 4,000 of his own people on Tarsus IV, which is said to occur some twenty years before the events of The Conscience of the King (stardate 2817.6-2819.8). It also ties in with the gap of fifteen years that is said to elapse between Space Seed (3141.9-3143.3) and Star Trek II: The Wrath of Khan (8130.3-8141.6), whilst explaining the seemingly small stardate gaps between Star Trek: The Motion Picture and Star Trek II, and between Star Trek V: The Final Frontier (8454.1) and Star Trek VI: The Undiscovered Country (9521.6-9529.1). Presumably there is some way of distinguishing cycles of stardates when necessary, such as calling them First Cycle or First Series, Second Cycle or Second Series, etc, though this would only ever be required when referring to previous cycles - in much the same way that, whenever anybody today refers to the 90s, we assume that they mean the 1990s unless otherwise indicated. You may have noticed that I keep on using words like about and approximately. This is because, even assuming that stardates cycle around every decade or so, the durations of these cycles are not entirely consistent. They seem to vary between approximately 900 stardate units to one Earth year during the time of the Tarsus tragedy, to about 1200 stardate units per year during the time of Captain Kirks first five-year mission in command of the USS Enterprise. For his first log entry in the episode Mudds Women, Kirk records a stardate of 1329.8. However, two subsequent log entries are dated earlier than this (1329.1 and 1329.2 respectively). I assume 1329.8 to be a slip of the tongue and that Kirk actually means 1328.9. The stardate gap between the end of Where No Man (1313.8) and the beginning of Mudds Women seems too small to accommodate all the equipment upgrades that the Enterprise has evidently undergone in the meantime. Some fans have speculated that during The Original Series stardates reflect the duration of each individual vessel or colonys mission, rather than being synchronised throughout the Federation. Stardates might therefore be suspended whenever a ship is taken off active duty for lengthy repairs or refitting, as appears to be the case here. 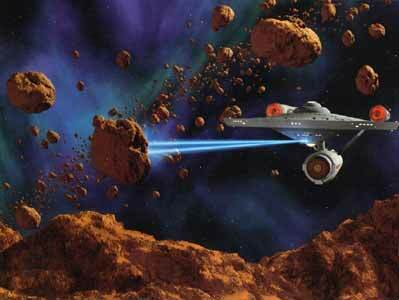 If this is the case, then the Enterprises stardates for the events of The Doomsday Machine are not known. Commodore Decker of the USS Constellation records a log entry for stardate 4202.1, but modifications to Enterprise equipment and uniforms in episodes with seemingly earlier stardates suggest that the Enterprises dates are not in synch with those of the Constellation. Production-wise, this is the first episode in which Kirk wears his second-season wraparound costume and the only episode in which its V-neck lacks a black trim. Production order would place this episode immediately before Wolf in the Fold (3614.9), which provides a convenient explanation for Uhuras absence from The Doomsday Machine: shes recovering from her brain wipe in The Changeling (3541.9). This would mean that the logs of the Enterprise and the Constellation are out of synch to the tune of approximately 0600.0 stardate units, or about five to six months, which may be an indication of how long the Enterprises refit lasted between Where No Man and Mudds Women. This theory may also explain why Professor Starness log for the science colony on Triacus in And the Children Shall Lead is out of synch with the Enterprises logs by at least 0011.0 stardate units. In the episode, the ship arrives at Triacus on stardate 5029.5. However, when the late Professor Starnes reports are played back, they cover the period 5025.3-5038.3. It could also account for the miniscule stardate gap that exists between the end of the animated episode Bem (7403.6) and the beginning of The Motion Picture (7410.2), if we assume that the Enterprises stardates are suspended during its extensive refit. Perhaps the purpose of such hiatuses is to give a better indication of ships and bases operational lifespans. Maybe this is why Admiral Morrow thinks the Enterprise is only twenty years old in The Search for Spock: it could actually be close to that figure in terms of actual years of service. Alternatively, Morrow might just be getting confused by the stardates, especially since, by the time of The Wrath of Khan, the Federation appears to have abandoned the idea of individual vessels and settlements using their own stardate systems (the USS Reliants stardates seem to be synchronous with those of the Enterprise). On a couple of occasions, Original Series episodes clash with each other in terms of their stardates. Kirks log entries in The Man Trap cover the period 1513.1-1513.8, which falls right in the middle of The Corbomite Maneuver (1512.2-1514.1). Similarly, the stardates for Dagger of the Mind (2715.1-2715.2) conflict with those of Miri (2713.5-2717.3). I assume that Kirk actually says thirty rather than thirteen in The Man Trap and fifty rather than fifteen in Dagger of the Mind, giving us stardates of 1530.1-1530.8 and 2750.1-2750.2 respectively. Similarly, in The Conscience of the King (stardate 2817.6-2819.8), Spock estimates that the ship will arrive at the Benecia Colony on stardate 2825.3, but The Galileo Seven spans the stardates 2821.5-2823.1. 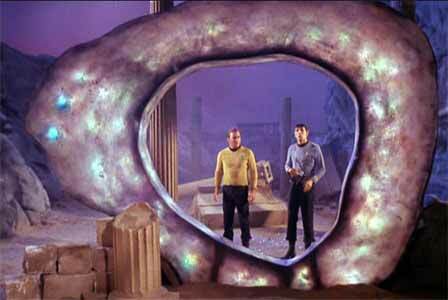 Evidently the ship accelerated once the murderer had been discovered and was able to improve on Spocks estimate. For his first log entry in The Deadly Years, Kirk records a stardate of 3478.2, but for his second entry he says 3579.4. I take this to be an early indication of senility caused by his accelerated ageing and that he actually means 3479.4. 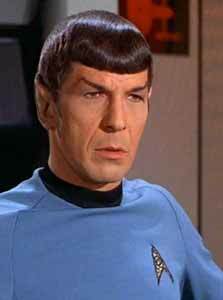 Similarly, the initial log entry in Spocks Brain is stardate 5431.4, but the second one is for stardate 4351.5. Again, I think matters are preying on the captains mind: he is worried about his first officers stolen brain, and probably means to say 5431.5. He also gets the designation of the planet Sigma Draconis VI wrong, twice referring to it as Sigma Draconis VII - thats how worried he is! At least three episodes of The Animated Series contain invalid stardates. The Magicks of Megas-Tu is said to take place on stardate 1254.4, which would place it before Where No Man Has Gone Before. However, the uniform and bridge design do not reflect this. The Eye of the Beholder seemingly occurs on stardate 5501.2, which places it in the middle of The Ambergris Element (5499.9-5506.2). The Practical Joker is apparently set during stardate 3183.3, but it must actually take place after The Enterprise Incident (5027.3-5027.4) because it shows Romulans using Klingon-designed D-7 class battle cruisers. In the timeline at the end of this feature, I have placed The Magicks of Megas-Tu in production order, after Mudds Passion (4978.5). The Eye of the Beholder has also been placed in production order, between The Terratin Incident (5577.3-5577.7) and Once Upon a Planet (5591.2). I have placed The Practical Joker just before How Sharper Than a Serpents Tooth (6063.4-6063.5), again in production order. The explanation for these erroneous stardates (shown as strikethrough text in my timeline) could be computer error. The Enterprises computer systems are seen to fail in The Magicks of Megas-Tu, and a gaseous energy field affects the computer in The Practical Joker. Im not suggesting that the crew do not know what the date is when they make their log entries, but that the computer erroneously adjusts the voice recordings of certain dates, rather like a present-day computer with an inaccurate internal clock assigning misleading modification dates to files. In my timeline, you may notice that I have placed Star Trek II: The Wrath of Khan in the year 2282. Most chronologies place the film later than this, despite both Kirk and Khan referring to the events of Space Seed (2267) as having taken place fifteen years earlier. This is because the vintage of the Romulan ale that McCoy gives Kirk as a birthday present is described as 2283. However, 2283 could be a stardate, which would make the ale more than five years old. 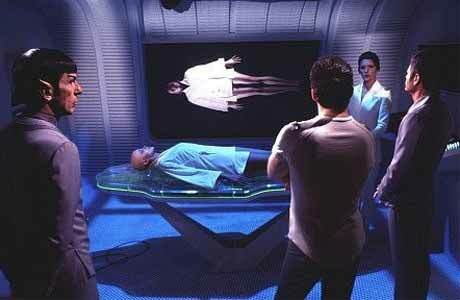 In Star Trek III: The Search for Spock, the Vulcans death at the end of the previous film is said to have occurred on stardate 8128.7, according to the Enterprises flight recorder, but Star Trek II occurs during stardates 8130.3-8141.6. Either the ships log or its flight recorder must be out by about ten stardate units. I choose to believe that it is the flight recorder that is in error, because otherwise it would mean that both Saavik and Chekov (on board the Reliant) get their dates wrong independently. It is not unreasonable to suppose that the Enterprises flight recorder might not be quite up to specs, as the ship is only expected to be used for brief training cruises. Admiral Kirks recap at the start of some versions of Star Trek IV: The Voyage Home refers to the stardate as 8031, which would place it before Star Trek II. However, Im not convinced that this log entry is canonical, because Kirk also tells us that it is the 23rd century - who is he addressing that might not know what century it is? Rather, I see this log entry as non-canonical narration for the purposes of bringing uninitiated viewers up to date with the story so far. This recap was not included on all prints of the film, only on those shown in Europe and South America, and it has never been released in the USA. If you wish to accept this prologue as canon (perhaps Kirk refers to the century in case future generations discover the recording), then he simply makes a mistake with the date or the Klingon ships log recorder skips a digit and what he really means to say is stardate 8331.0. On to The Next Generation, and in Encounter at Farpoint Data claims that he graduated from Starfleet Class of 78, but the later episode The Neutral Zone reveals that the series takes place in the 2360s. I theorise that Data is referring to a class located on Starbase 78. As I indicated earlier in this feature, the stardates used in TNG proved to be more organised than those used in previous series - but only after a shaky start. The numbers heard in the first season are all over the place. If you were to list these episodes in stardate order, then Tasha Yar would participate in several episodes after she has died in Skin of Evil (stardates 41601.3-41602.1). Dialogue also indicates that the episode 11001001 (41365.9) follows directly on from Datalore (41242.4-41242.5), though the stardates suggest otherwise. Other factors to be taken into consideration include references in Coming of Age (41416.2) to (amongst other episodes) The Battle (41723.9). It is interesting to note that, in Coming of Age, the investigator Remmick states that he has discovered several discrepancies in Picards log entries. Could this be evidence that some stardates are less reliable than others? Then theres the fact that the Enterprise computer receives an upgrade from the Bynars in 11001001. I believe that this could be partly prompted by glitches in the computers recording of stardates, as I suggested for the anomalous dates in The Animated Series. My timeline places the affected episodes in what I believe to be a best-fit compromise, preserving as many of the transmitted stardates as possible while also taking into account production order where feasible. As with the Animated Series anomalies, those marked with strikethrough text have been adjusted by me, and are followed by suggestions for what the true stardates might be. This does leave quite a few episodes taking place between 41153.7 and 41365.9. This is because I am working on the assumption that the computer glitch is corrected shortly after the events of 11001001. The Last Outposts stardate must also be deemed unreliable, because it has to happen before The Battle, which itself must take place before Coming of Age. In Dark Page, a diary entry referring to Lwaxana Trois marriage to Ian Andrew Troi, supposedly in the 2330s, has a stardate of 30620.1. Working backwards from the dates used elsewhere in TNG, that stardate would occur in the year 2353. Unless we assume that Betazoids grow up super-fast and that Deanna Troi is just ten years old in the first season of TNG, 30620.1 cannot be a true Federation stardate. Perhaps the planet Betazed has different stardates to the majority of the quadrant. Perhaps the Betazoids got tired of resetting the four-digit dates to zero every decade and so switched to their own five-digit system several years ahead of the rest of the Federation. 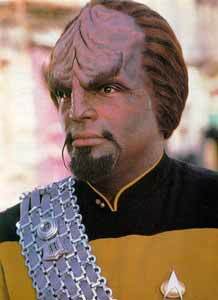 On to Deep Space Nine now, and in the episode Second Sight (stardate 47329.4), Captain Sisko claims that it is the fourth anniversary of the Battle of Wolf 359, which occurred in the two-part TNG story The Best of Both Worlds (43989.1-44001.4). However, going by the stardates, thats a gap of little more than three years. Fortunately, it has been established that Deep Space Nine operates on Bajoran time, with 26 hours in each day, so it seems logical to apply this to years too. 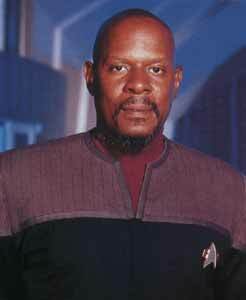 Therefore, Sisko could be referring to Bajoran years, which must therefore be about 300 Terran days long. And talking of the Borg, in the episode In Purgatorys Shadow, Sisko mentions the recent Borg attack, presumably the one depicted in Star Trek: First Contact (50893.5). However, in the very next instalment, By Infernos Light, a stardate of 50564.2 is logged, which would place In Purgatorys Shadow before First Contact. It is possible that Sisko is referring to the Borg confrontation in William Shatners novel The Return, which probably occurred about a year and a half previously, between Star Trek: Generations (48632.4-48650.1) and The Way of the Warrior (49011.4). The timeline that follows does not cover the entirety of Trek history. It deals only with the period from the birth of James T Kirk to the end of the first season of TNG. This is because, with the exception of Second Sight and In Purgatorys Shadow, which are explained above, I dont feel that any of the stardates after this period are in question. Several broadcast episodes do not contain stardates. Some of these have been allocated stardates in other sources, such as reference guides and fotonovels - only a couple of which I have accepted. For instance, many sources suggest dates of 3134.0 and 2534.0 respectively for The City on the Edge of Forever and Patterns of Force. These dates are taken from early draft scripts of the episodes. However, these dates deviate significantly from the shows production order, so I have disregarded them in favour of production order. This way, we also avoid having two time-travel stories next to each other (City and Tomorrow is Yesterday). Conversely, in his novel Q-Squared, Peter David suggests a stardate of 3823.7 for Mirror, Mirror, which I have taken on board because it does not conflict with the production order (unlike Diane Duanes suggestion of 4428.9 in her novel Dark Mirror). Similarly, I have accepted the stardate that reference book authors have assigned to A Piece of the Action (4598.0), which is apparently based on an early script, because it still follows production order, taking place before By Any Other Name (4657.5). The fotonovel of this episode offers a concluding stardate of 4598.7. Because most of the animated episodes occur in between episodes of the live-action series, I have distinguished their production codes with the letter A.